In Thailand, if you go to American fast food chains like Burger King, McDonald’s or KFC, often it’s because you are more wealthy than the average Thai, and you want to have a special treat, not quite the same as why we eat fast food in America! The American fast food chains in Thailand are usually two stories, clean and kept up well, at least more so than most Thai street vendors stalls. And most things on the menus are usually double the price of typical Thai street food. I don’t ever go to KFC in America, but KFC in Thailand is a different story. When we visited Thailand a few years ago my only regret when we got home was that we had only visited KFC once. Last summer when we visited again, we made multiple KFC trips, so I could get my fill on my guilty pleasure, Thai KFC Spicy Chicken Rice Bowl!! 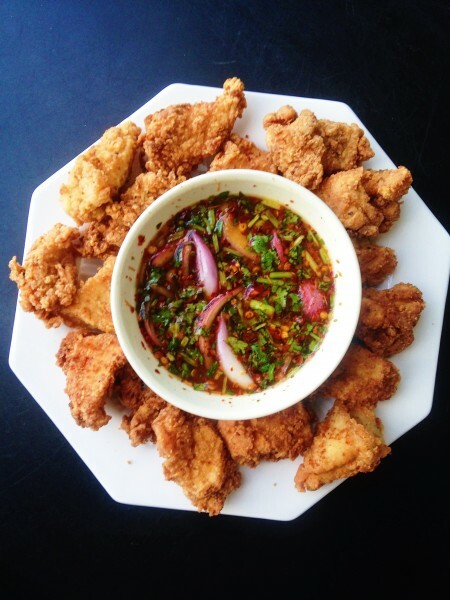 The crunchy fried chicken, super spicy and lime laarb flavors, roasted rice powder, cilantro and shallots over rice, is SO SO finger lickin’ good!! And nothing like what you would find at KFC in America. I was at a loss for how to make KFC’s Thai Spicy Chicken Bowl at home taste as good as it did in Thailand, and didn’t even want to try. 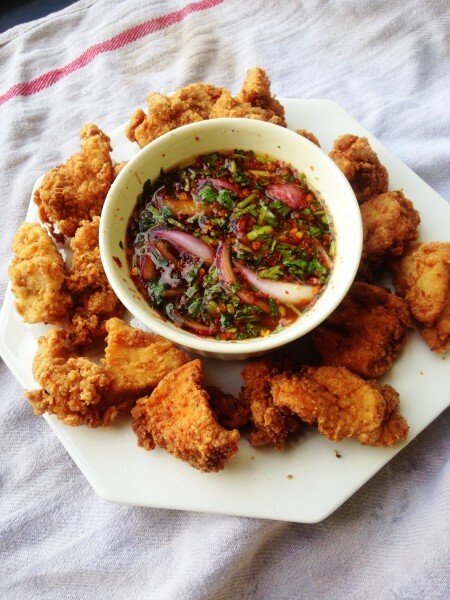 But the other day I was making fried chicken bites, and my Thai Hubby reminded me we still had a nam jim jiaw sauce in the fridge that we needed to use up. He thought it would work with the fried chicken bites. 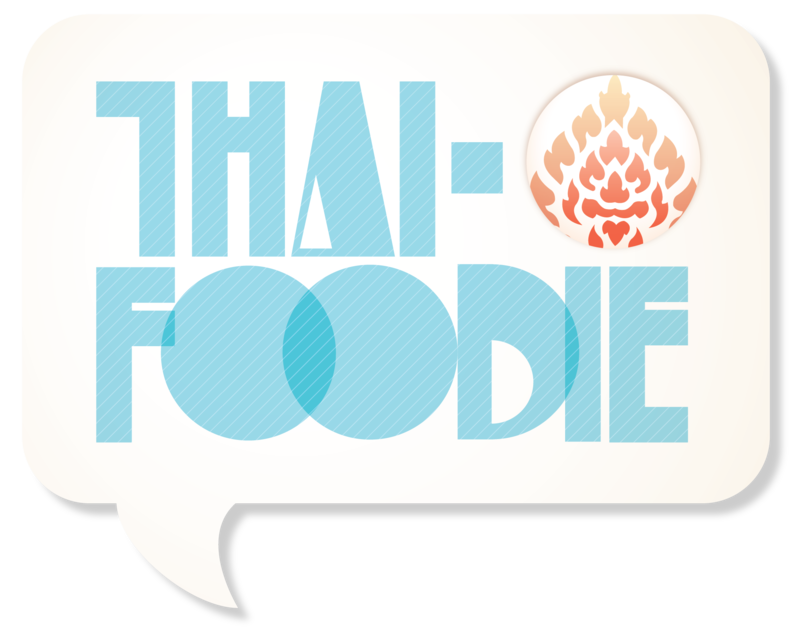 He dipped in the fried chicken nugget into the spicy Thai sauce, and gave me a taste, and we both looked at each other and said, “So good! 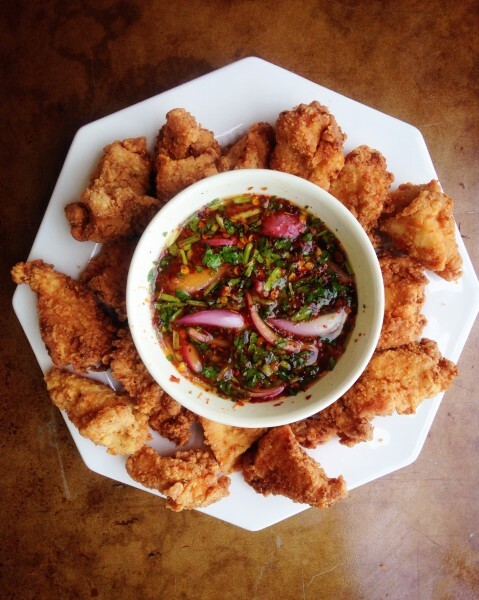 Just like KFC in Thailand! !” The mystery of how to make Thai KFC Spicy Chicken rice bowls was solved. And I HAD to share this recipe with you so you could experience our guilty pleasure with us! Make this tonight, and let us know what you think! If you love Thai KFC's spicy chicken rice bowls and want to make it at home, now you can with this fun recipe! Marinate the chicken for 30 minutes in the salt, pepper and garlic powder. 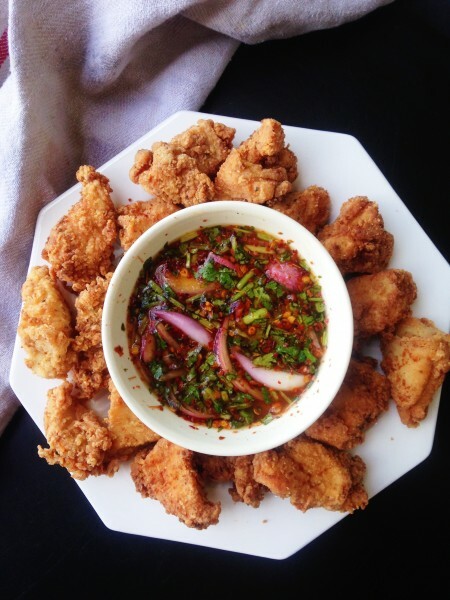 While the chicken is marinating you can make the Thai spicy sauce. Mix all the ingredients together and taste it. We like it to taste more on the sour and spicy side, but make it however you prefer. Mix the chicken pieces with the flour until each piece is white and not sticky. You may need to add more flour than you expect and that's ok. Warm the oil in a wok on medium-high. Once you drop a piece of flour batter in the wok and it sizzles and starts to fry up the wok is hot and ready. Add some of the chicken into the wok. Make sure it isn't overcrowded because it wont fry as well or as quickly. We usually have to fry it in a few batches. Fry the chicken until golden on the outside and then flip it over to fry the other side. Other than that, try not to touch the chicken too much while it's frying. It should only take a few minutes for it to cook since it's cut in smaller pieces. Once it's golden, on both sides, place it on a baking sheet covered with paper towels. Once chicken is all fried, place jasmine rice in each bowl. Add the chicken and sprinkle some of the sauce over each bowl. Or you can do it like we have recently and dip the chicken into the sauce. Whichever way makes your heart the happiest.